TS POLYCET 2018 is a common entrance exam in the state level conducted by SBTET, Telangana conducted for admission into Engineering and Non-Engineering diploma programs which are offered by various polytechnic colleges in the Telangana state. 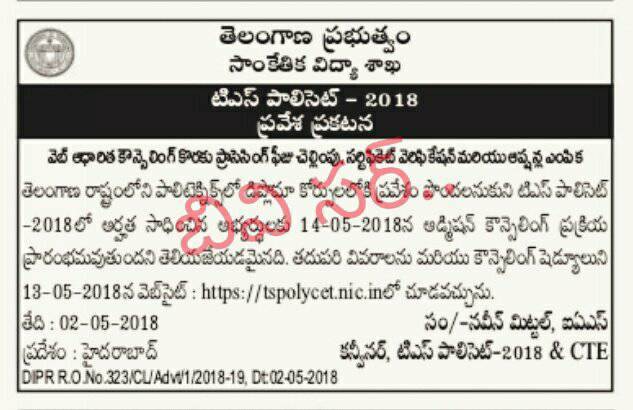 TS POLYCET 2018 online applications will be made available from 1st week of March 2018 tentatively. 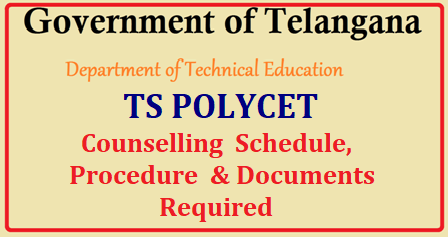 TS Polycet Counselling 2018 will be starting in the month of May 2018. The counselling (choice filling) will be conducted via online mode on the website. The counselling procedure will be regulated by the Department of Technical Education, Telangana. Only qualified candidates can appear in the counselling process. It is organized for candidates, those seeking admission into various polytechnic courses in the Telangana state. These courses are offered in the field of engineering & non-engineering. In this article, we have updated detailed information about TS Polycet 2018 Counselling. The web based counselling will be comprised of certificate verification & option exercising. Candidates will be called for counselling on the basis of rank. Counselling will start with document verification & then candidates have to apply for choice filling option. Choice filling will be done through online mode. The document verification procedure will be organized only through offline mode. It will be started in the month of May 2018. Candidates, those who have qualified the exam have to attend certificate verification process in any of the designated Help Line Centers (HLCs). It is necessary to verify the documents for admission into polytechnics. The counselling fee is Rs. 500 for OC/BC candidates & Rs. 250 for SC/ST candidates. The fee can be paid at the time of the verification process. Candidates should verify their documents at any of the designated Help Line Centers (HLCs) in a given schedule. It is compulsory to attend the certificate verification process for the candidates. Because, during this process, candidates aadhaar card details (Finger Print Biometric) will be verified with UIDAI at Help Line Centers. After verification, candidates will be issued a receipt of Certificates at Help-line Centres. Candidates have to fill choices of courses & colleges at the time of exercising options. It will be started after the certificate verification procedure. List of polytechnics with courses offered by them & course codes will be given in the official website. Candidates can list out polytechnics in order of their preference based on course code & polytechnic codes. Candidates should first prepare a priority number with a list of courses in the blank option form. After that candidates can fill the options on the web. Candidates have to take a print out copy of filled choices for future purpose. The seat will be allotted to the candidates on the basis of filled options, merit rank & category. The allotment will be published on the website through online mode. Candidates have to download their allotment order for admission process. Candidates can download allotment order by entering ROC Form Number, Hall Ticket Number, Password & Date of Birth via candidate login. Candidates have to visit at any one of the designated banks with a downloaded allotment order for fee payment. After that candidates have to report at the allotted polytechnic with allotment order & fee receipts on or before the specified dates. If candidates fail to report at the allotted college for admission in a given time period, the seat will be allotted to the next candidates. In this case, candidate’s admission will be cancelled & candidates will not claim for further seat allotment.